Here's a great note which you can use to write an essay on MY FAVOURITE PASTIME, HOW I SPEND MY LEISURE TIME or WHAT I DO IN MY SPARE TIME and also MY HOBBY topic. 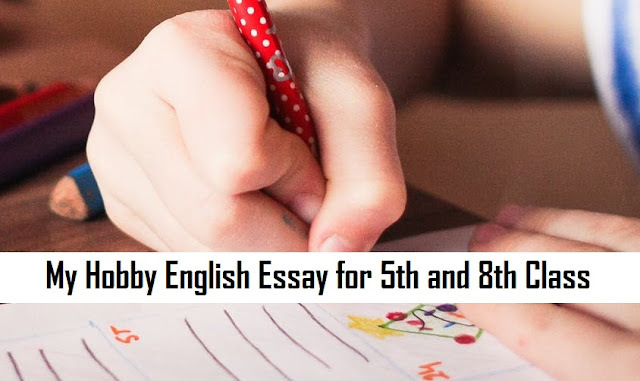 So read this English essay online with easy wording or download and print for your kids. people usually take on, may be gardening, collecting matchboxes, collection of stickers, collection of the coins of different countries, collecting stones and philately (Collection of stamps). a refreshing hobby. I have a spare piece of land at the back of my house. I fulfill my fondness for gardening there. It is helpful as well as affordable hobby. I really enjoy it and it keeps my lawn colorful the whole year. First of all, I soften the land with manure and irrigate it to make the land fertile. Then, I sow the seeds of different vegetables and fruits and I also take the twigs of some fragrant flowers and sow them in the flower pots. I regularly water them and take a very good care of them properly. After a few weeks, my efforts are granted and I enjoy seeing my lawn full of colorful flowers, fruits and vegetables. This is the most pleasant sight for me. I like my hobby very much. If you want more English essays like this then do comment below and share this page with your fellow students.